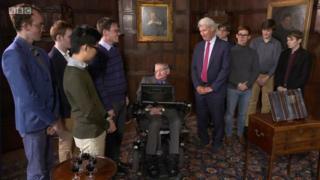 Professor Stephen Hawking has presented the winning University Challenge team with their trophy – and revealed he is a long-time fan of the show. 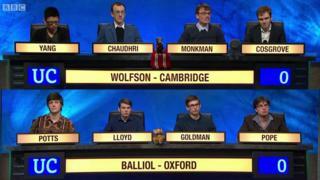 Oxford’s Balliol College beat Wolfson College, Cambridge, by 190 to 140 in the final of the BBC Two show. 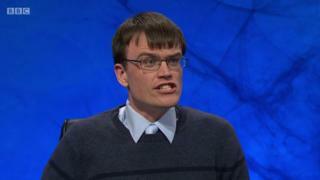 The series was a hit on social media, in large part due to fan favourite Eric Monkman, who captained Wolfson. Despite his team’s loss some took to Twitter to describe the 29-year-old as the “people’s champion”. Host Jeremy Paxman told Wolfson they had been “entertaining”. Professor Hawking told the two teams: “I have said in the past that it is not clear whether intelligence has any long-term survival value – bacteria multiply and flourish without it. “But it is one of the most admirable qualities, especially when displayed by such young minds. It was only the second time in the quiz’s 55-year-history that the trophy presentation had taken place outside the studio. 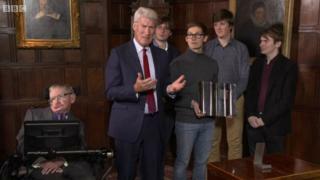 In the segment, Paxman congratulated the winners and told Wolfson there was “no shame in being runners-up”. Balliol then toasted their win with glasses of port. Oxford colleges had lost to Cambridge for the past three years – until the 2017 final, broadcast on Monday night. Could you answer these University Challenge questions? Here is a selection of some of the questions Balliol answered correctly to beat Wolfson. Answers at the bottom of the story. In which city of the Eastern Roman empire did Hypatia teach philosophy? Associated with the philosopher Plotinus and the supreme principle known as the one, which late school of Greek philosophy did Hypatia espouse? Which German philosopher applied Newtonian principles to the Nebular hypothesis in his 1755 work Universal Natural History and Theory of the Heavens? In Earth science what four-letter term denotes the zone that separates the Earth’s crust from the mantle? Monkman, from Canada, was applauded by fans for his enthusiastic performances and the encyclopaedic knowledge he displayed. He had scored 120 of his team’s 170 points in a previous round, with the hashtag #Monkmania springing up for fans to praise his prowess. But in the end, the Balliol team captained by Joey Goldman proved too strong for Monkman and his teammates.